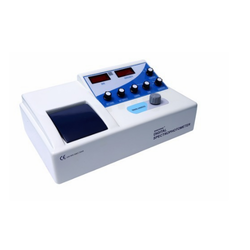 Prominent & Leading Manufacturer from Panchkula, we offer microprocessor visible spectrophotometer s-923, microprocessor visible spectrophotometer s-922 and digital spectrophotometer s-921. 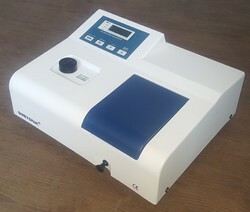 Microprocessor Visible Spectrophotometer offered features single beam, grating 1200 lines/mm optical system that comes with spectral bandwidth of 5 nm, wavelength range of 320 ~ 1000 nm and wavelength accuracy of + 2.0 nm. These advanced technology based spectrophotometers also feature wavelength reproducibility of 1 nm, photometric accuracy of + % T, photometric reproducibility of < 0.5 % T, Tungsten – halogen lamp 6V/10Wbased light source and 4 LED digital display support. Offering stable & accurate functionality support, these deliver high VIS performance between 325 to 1000 nm and RS232C communication support. Technical Specifications: Optical System Single Beam, Grating 1200 lines/mm Spectral bandwidth 5 nm Wavelength Range 320 ~ 1000 nm Wavelength Accuracy + 2.0 nm Wavelength reproducibility 1 nm Photometric Accuracy + % T Photometric reproducibility < 0.5 % T Stray Light < 0.5 % T, - 0.097-2.000A, 0~1999 C Light Source Tungsten – halogen lamp 6V/10W Display 4 LED digital display Data Output RS 232 C Power 220 V, 50 Hz. Salient Features: Highly Stable & Accurate High VIS performance between 320 to 1000 nm Automatic 0 % T, and 100 % T Calibration RS232C communication 4 position sample holder (10 to 50 mm cuvettes) Standard curve through software. 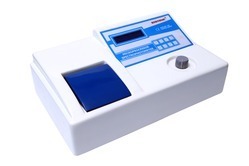 We are one of the leading suppliers & Manufacturer of Microprocessor UV / VIS Spectrophotometer, Digital pH Meter, Photo Colorimeter, Conductivity Meter, Dissolved Oxygen Meter, Water / Soil Testing Kit, Spectrophoto Meter, Turbidity Meter, TDS. Salinity Meter, Digital Colony Counter, Karl Fisher Titrimeter, Digital Potentiometer, Flame Photometer, Microprocessor Instruments Etc. We are among the very few names in the field of Instrumentation to offer latest technology Instruments for Agriculture, Aqua Culture, Biotechnology, Cement, Chemical, Chemical & Labs, Dairy, Fertilizers, Food & Beverage, Hospitals, Iron & Steel, Industrial Water Disposal, Mineral Water Plant, Metallurgy, Mines & Geology, Pollution Control, Petro Chemical, Plants & Dyes, Pharmaceuticals, Potable Water Plants, Sewage Plants, Textile. Featured with Latest technology & designed to meet the needs of modern industry. our products are widely used in laboratory Being one of the leaders for over two decades, we have constantly upgraded our technology and offered excellent after-sales service.